Very silent sound, immediate implementation was possible with wiring. It was perfect if there was a little more power. This review is about item#8584125. I bought it for fans for composteries because it is small and quiet. . . I am in trouble because the sound is big (like a fan of an old personal computer) Is it lucky that I hit a bad product? I am considering purchasing fans from different manufacturers. Good usability. It is very useful to lower the heat of electric appliances. As for the exhaust heat of the amplifier, I purchased it with particular emphasis on quietness, but as expected, it was awesome quietness. There is not much air volume, but it was within the range of assumption, so I do not feel the problem in particular at present. However, one of four of the first purchases was clearly noisy and it was NG, so I bought one new one. 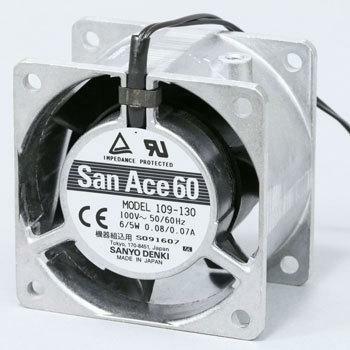 Although it is a quiet AC fan, it seems that there are variations in manufacturing. It is very easy to use because it is small and sound quiet. It is good that the price is not so high. This review is about item#08584125. The front glass door has almost no evacuation spot on the rear side. Since the amplifier and BD recorder housed in the AV rack are hot, they are mounted on the AV rack rear plate for the exhaust heat. Although the static pressure and the air volume were sufficient, and the noise was uneasy, it surprisingly dissipated heat and it was very quiet. Noises are very satisfying at a level which is not at all mind even at midnight. Used for extrusion in 50 Hz area.